I was very good on Black Friday. There was only one store I was really bothered about spending all my money in and that was Stick With Me Shop on Etsy. It has so many awesome cute stickers, at reasonable prices (and reasonable shipping costs) that I just had to get a load of stickers saved in my basket for Black Friday weekend. Just 8 days after I bought them, my little haul arrived! Here’s a little run down of these beautiful, practical stickers! One of the main reasons I liked this shop was the size of the stickers. Everywhere you look at the moment there’s shops full of EC stickers and using a personal Filofax, none of those stickers were suitable. These stickers however, are a perfect size not just for EC, by my Filo inserts too! These plain boxes and daily habit trackers are fab and don’t take up a whole day’s box. I’d love a page of just panda ones though! 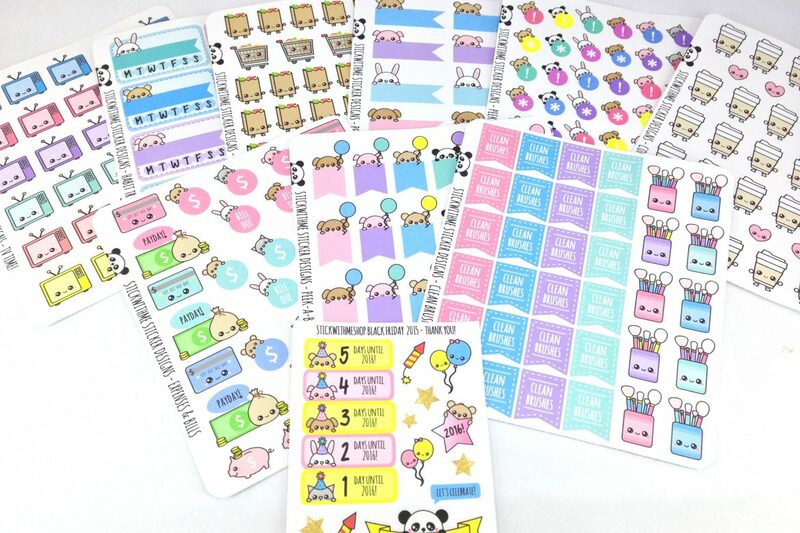 I’ve been after some cute financial stickers for a while and these fit the bill! The little icon stickers are perfect for marking important events in my planner too. The colours used in these stickers are lovely – another thing I keep finding in a lot of these EC-style shops is really bright colour palettes, and they’re just not for me… I don’t like anything too bold in my planner. I don’t watch much TV but when I do… I like to mark it prettily in my planner! These clean brushes are also fab… although I’d prefer a full page of the cute brush holder style. I didn’t even need any coffee stickers but these were too good to pass up and how much nicer will having to do food shopping seem with these stickers?! These are all really nice quality stickers. I’m jealous of how well printed and cut these are… I just can’t get the same level of precision out of my Silhouette! I’ll definitely be shopping with Jenny again. She’s got some lovely stickers, quick turn around time and great prices!